are we a part of this cloud? this communion of saints? the church militant? 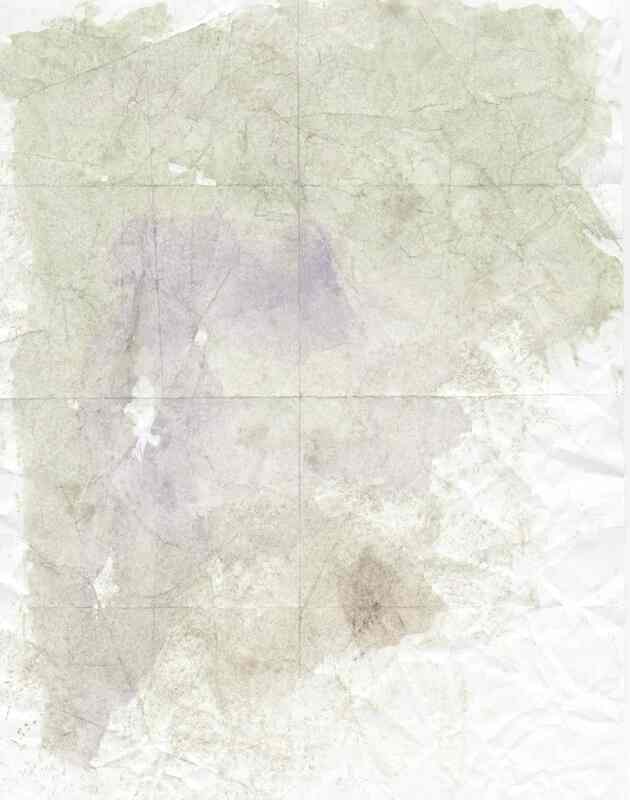 RDCW.21110 - (pricing // order) "COMMUNION OF SAINTS II"
RDCW.21130 - (pricing // order) "REDEMPTIVE SUFFERING IV"
As children of God, are we a cloud of witnesses? C0-Redeemers through Christ? Our vocation? How can we overcome the troubles in this world? Are we the Church Militant? AS CO-REDEEMERS THROUGH CHRIST ! In John 16, the Lord reminds us 'in the world we will have trouble' Yet we have in our reach, through his most Sacred Heart, his unfathomable treasury of gifts. With these limitless and most powerful gifts of grace and mercy, we will overcome the troubles of the world. These gifts invite us to become Intercessors and Co-Redeemers with and through Christ for the benefit of all. Who are we? We are members of the Body of Christ. We are part of the Great Cloud of Witnesses, the Communion of Saints the Mystical Body of Christ. We are Intercessors, Co-Redemers. We are Children of God. We are in communion with all in heaven (triumphant), on earth (militant) and under the earth (penitent). We are family. We are of the Church Militant and there is a war going on and we are called through our prayers and sacrifices to respond. It is our vocation. We have work to do! 10 that at the name of Jesus every knee should bend, of those in heaven and on earth and under the earth, 11 and every tongue confess that Jesus Christ is Lord, to the glory of God the Father. 12 So then, my beloved, obedient as you have always been, not only when I am present but all the more now when I am absent, work out your salvation with fear and trembling. Who makes up this ‘Cloud of Witnesses? As those living on earth we are a community of witnesses. As those in heaven; St. Paul, Francis, Terese, martyrs and saints along with our loved ones who have attained holiness, are a community of witnesses. This would include the ‘penitent’ who are preparing for heaven. So we are all that Cloud of Witnesses, that make up the fullness of the body of Christ. (They, we are not so much observing - as we are witnessing to the truth). 1 Therefore, since we are surrounded by so great a cloud of witnesses, let us rid ourselves of every burden and sin that clings to us and persevere in running the race that lies before us 2 while keeping our eyes fixed on Jesus, the leader and perfecter of faith. The Communion of Saints (in Latin, communio sanctorum), includes the spiritual union of all members of the Christian Church living and the dead, those on earth, in heaven, and, for those who are in that state of purification. (Purgatory) They (we) are all part of a single "Mystical Body", with Christ as the head, in which each member contributes to the good of all and shares in the welfare of all. We are closer than we realize as only the mystical veil of space and time separate us for now. 12 As a body is one though it has many parts, and all the parts of the body, though many, are one body, so also Christ. 13 For in one Spirit we were all baptized into one body, whether Jews or Greeks, slaves or free persons, and we were all given to drink of one Spirit. 14 Now the body is not a single part, but many. ---- 21 The eye cannot say to the hand, "I do not need you," nor again the head to the feet, "I do not need you." (#1475) we are reminded 'In the communion of saints, "a perennial link of charity exists between the faithful who have already reached their heavenly home, those who are expiating their sins in purgatory and those who are still pilgrims on earth. between them there is, too, an abundant exchange of all good things. "87 In this wonderful exchange, the holiness of one profits others, well beyond the harm that the sin of one could cause others. Thus recourse to the communion of saints lets the contrite sinner be more promptly and efficaciously purified of the punishments for sin." HOW DO WE RESPOND? - HOW ARE WE TO PRAY? suffer with it; if one part is honored, all the parts share its joy. AVE BEADS: Aves are a high grade Czech crystal glass that have tiny particles that catch the light in a special way. 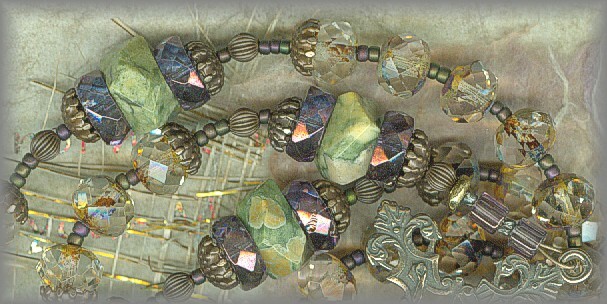 PATER BEADS: Each Pater chunk of Rhyolite (stone that comes from volcanic action) is framed with faceted amethyst. CCC # 2683 - The witnesses who have preceded us into the kingdom,41 especially those whom the Church recognizes as saints, share in the living tradition of prayer by the example of their lives, the transmission of their writings, and their prayer today. They contemplate God, praise him and constantly care for those whom they have left on earth. When they entered into the joy of their Master, they were "put in charge of many things. "42 Their intercession is their most exalted service to God's plan. We can and should ask them to intercede for us and for the whole world. Available individually from our parts catalogue . See full collection in solid bronze, sterling silver and new: white bronze. All hand cast from antique and vintage pieces. See SUPPLIES link above. After this I had a vision of a great multitude, which no one could count, from every nation, race, people, and tongue. They stood before the throne and before the Lamb, wearing white robes and holding palm branches in their hands. 3 Consider how he endured such opposition from sinners, in order that you may not grow weary and lose heart. 4 In your struggle against sin you have not yet resisted to the point of shedding blood. 5 You have also forgotten the exhortation addressed to you as sons: "My son, do not disdain the discipline of the Lord or lose heart when reproved by him; 6 for whom the Lord loves, he disciplines; he scourges every son he acknowledges." 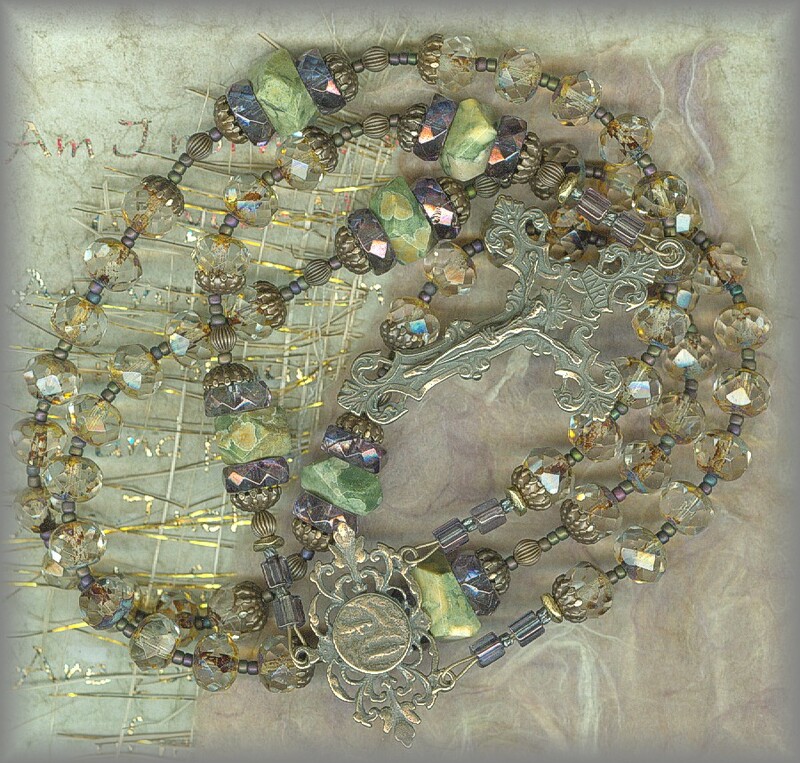 AVE BEADS: Ave beads are 'gemcuts' with rich variegations that pick up not only the amethyst but other soft colors as well. Eye defines a more subtle coloration than the camera. 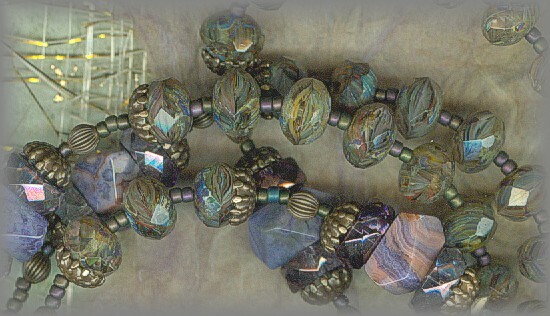 PATER BEADS: Each large faceted chunk of Purple Crazy Laced Agate carries a different design, no two alike. Faceted Amethyst rest on either side with antiqued metal caps. As a body is one though it has many parts, and all the parts of the body, though many, are one body, so also Christ.....there are many parts, yet one body. If [one] part suffers, all the parts suffer with it; if one part is honored, all the parts share its joy. 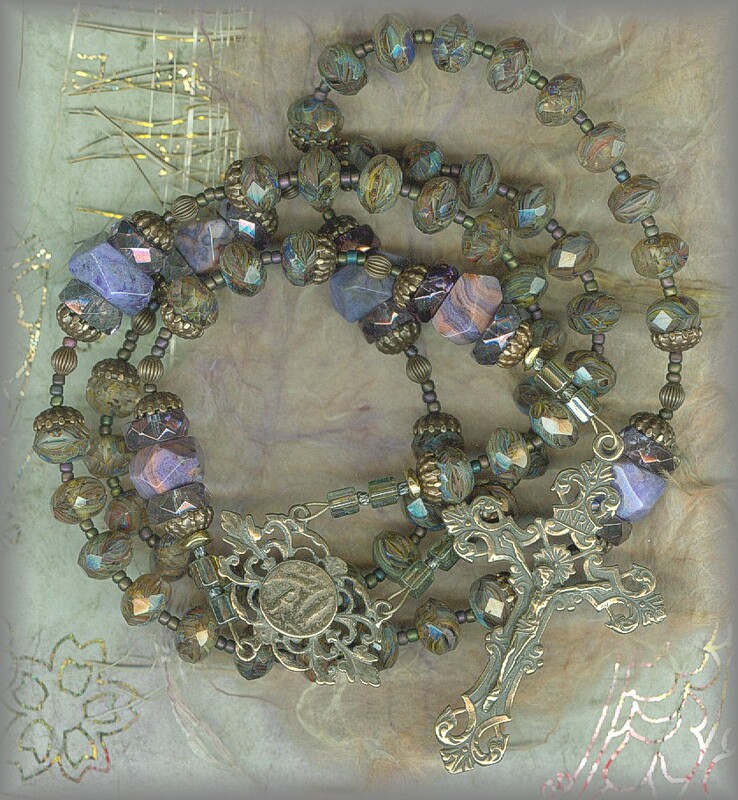 AVE BEADS: beads are called 'gemcuts' amd allow for an overall shorter rosary. 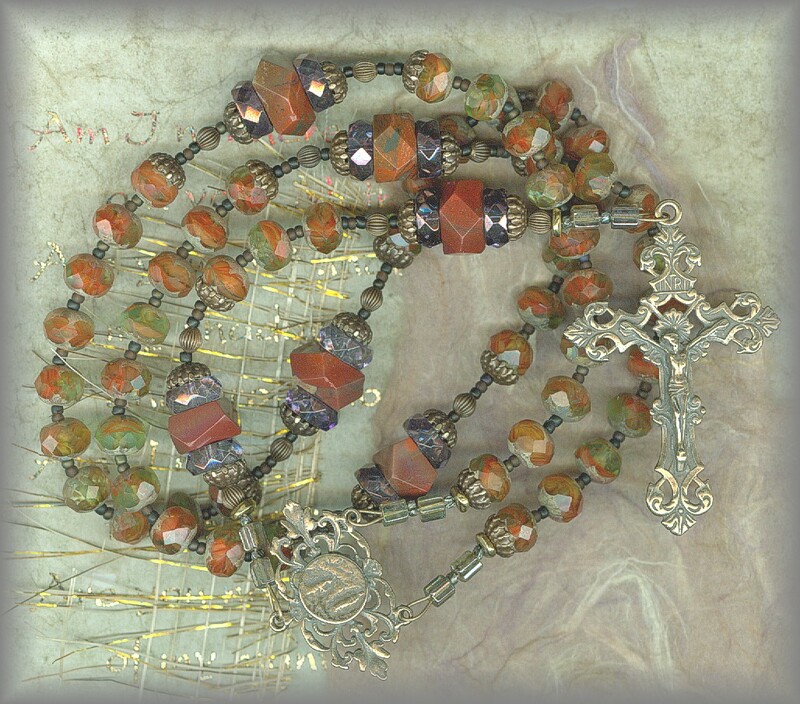 The choice of Aves, crystal with red inclusions, represent the blood of Christ. 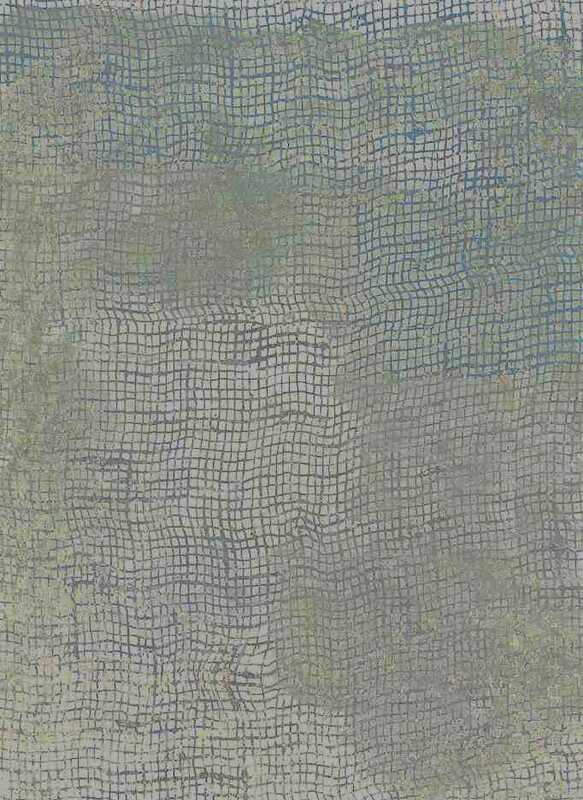 The areas that appear mossy are acutally clear representing the water. 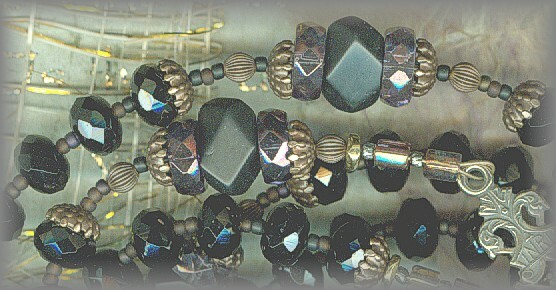 PATER BEADS: Each Pater is made up of faceted Apple Jasper Chunks surrounded by Amethyst rondelles and capped with antiqued metals. When he took it, the four living creatures and the twenty-four elders fell down before the Lamb. Each of the elders held a harp and gold bowls filled with incense, which are the prayers of the holy ones. 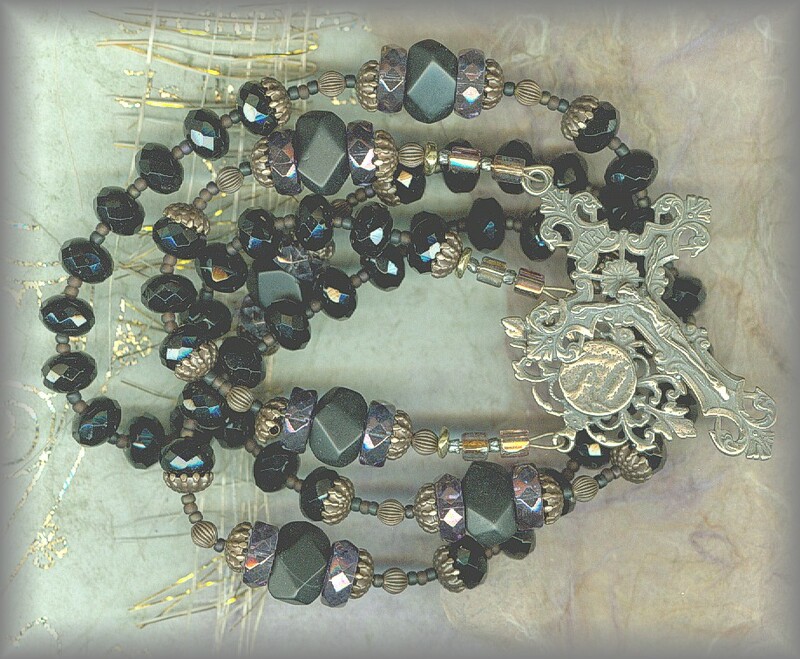 AVE BEADS: Deep, rich, Jet Black faceted 'gemcuts' give continuity to the PATER BEADS: matte, faceted chunks of onyx surrrounded by faceted amethyst rondelles. Each framed with antiqued caps. CCC # 1505 - The Catechism of the Catholic Church encourages and reminds us of our vocation: "By His passion and death on the Cross, Christ has given a new meaning to suffering: it can henceforth configure us to Him and unite us with His redemptive passion"
Center is that of Bernadette and Our Lady in a filigree frame. 1 Faith is the realization of what is hoped for and evidence 2 of things not seen. 2 Because of it the ancients were well attested. 3 By faith we understand that the universe was ordered by the word of God, 3 so that what is visible came into being through the invisible. We are reminded that we are God's coworkers in 1 Corinthians. We plant or water but it is God who makes it grow. Our planting of the seed (the seed is the word of God) or watering of the seed is done in union with Christ the head as members of His Mystical Body through our prayers and sacrifice for others. We call on Our Lady and the Saints to intercede for us just as we would ask another family member or friend to pray for us. Sometimes we just think, "Offer it up' and dont think of our suffering in relation to another persons needs. And if Jesus gave himself as ransom for us all, (1 Timothy 2:5-6) what could I add to that? Remember we are one body in Christ and so we co-operate with God in a marvellous way. In 1 Corinthians 3:9 (above) "For we are God's co-workers" and we help Our Lord Jesus in his redemptive work by offering up our suffering as members of the Mystical Body of Christ. We also need to help others realize this powerful gift. "Now I rejoice in my sufferings for your sake, and in my flesh I am filling up what is lacking in the afflictions of Christ on behalf of his body, which is the church, "
5 For there is one God. There is also one mediator between God and the human race, Christ Jesus, himself human, 6 who gave himself as ransom for all. Father Corey helped clarify by adding: "St. Paul obviously believes that Jesus is the one redeemer between God and man. He is the one who wrote in 1 Tim. 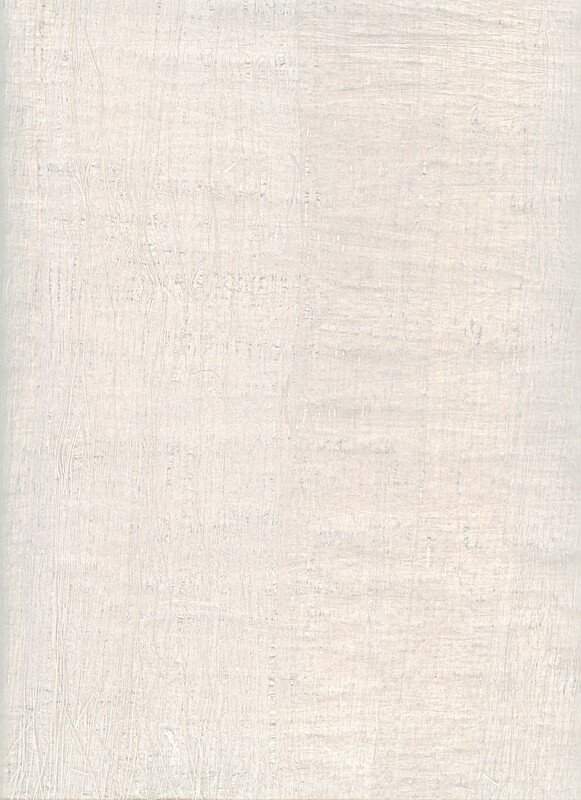 2:5-6, "For there is one God. There is also one mediator between God and the human race, Christ Jesus, himself human, who gave himself as ransom for all." He is not, therefore, saying that we add something that He didn't already attain. What does St. Paul mean, then, when he says "in my flesh I am filling up what is lacking in the afflictions of Christ on behalf of his body, which is the church"? He is saying that as members of the mystical body of Christ, we are called to distribute the graces and blessings He merited by His passion, death, and resurrection. 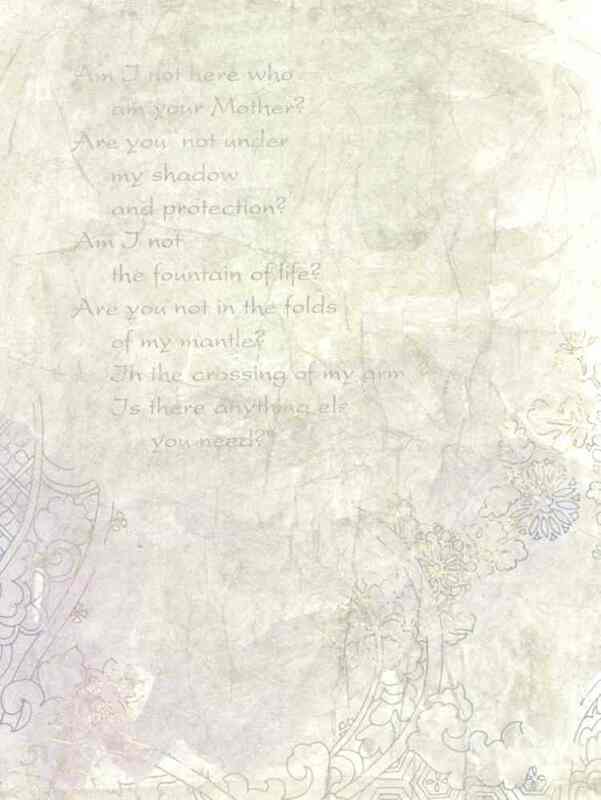 How do we distribute these graces? By prayer and sacrifice. It's no different today. If we want to help spread the kingdom of God as our Lord commanded us to do, we must pay the price. The big price has already been paid (our Lord has won salvation for us), but we must do our part. I urge you therefore, brothers, by the mercies of God, to offer your bodies as a living sacrifice, holy and pleasing to God, your spiritual worship. 2 Do not conform yourselves to this age but be transformed by the renewal of your mind, that you may discern what is the will of God, what is good and pleasing and perfect. The Catechism (2559) reminds us that we are beggars before God. It reminds us "prayer is the raising of ones mind and heart to God" We are asked if we speak from the height of our pride or 'out of the depths of a humble and contrite heart' 3 He who humbles himself will be exalted; 4 humility is the foundation of prayer, Only when we humbly acknowledge that "we do not know how to pray as we ought. "For we do not have a high priest who is unable to sympathize with our weaknesses, but one who has similarly been tested in every way, yet without sin. 16 So let us confidently approach the throne of grace to receive mercy and to find grace for timely help." 26 - - the Spirit too comes to the aid of our weakness; for we do not know how to pray as we ought, but the Spirit itself intercedes with inexpressible groanings. 27 And the one who searches hearts knows what is the intention of the Spirit, because it intercedes for the holy ones according to God's will. as she is the most powerful intercessor we have, remember, Jesus listens to his mother! "Have no anxiety at all, but in everything, by prayer and petition, with thanksgiving, make your requests known to God. have you heard about Our Lady of Good Help? the first approved (2010) apparition in the US?